Ethiopia, the ethnically diverse country is being rocked by age-old ethnic tensions and ethnic violence is on the rise. These conflicts are not new, but the levels of violence being witnessed today are very disturbing. One of the places where ethnic-based violence occurs is Universities as students from different regions are assigned to join a certain campus. Students with Amhara ethnic background who were learning at Bule Hora University located in Oromiya region, held a demonstration yesterday in Bahir Dar. The students left the University and took shelter in Bahir Dar Stadium after an ethnic clash in the campus. The students held a protest march today demanding to be assigned to universities in their own hometowns. 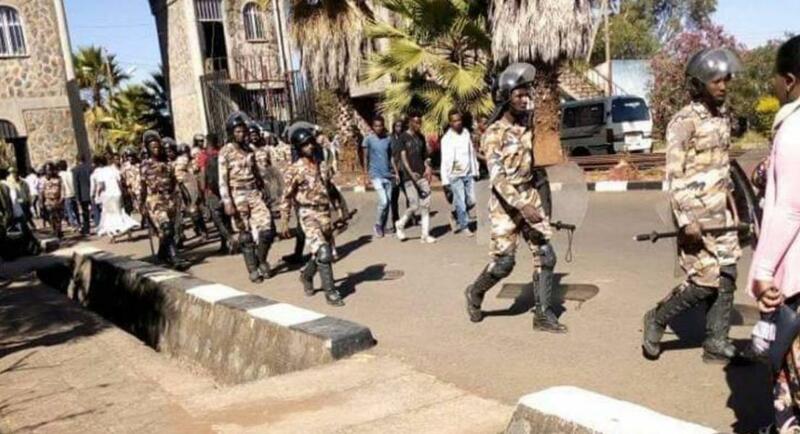 The Amhara Region special police took positions at various areas of the city when some of the students started throwing rocks at government buildings and things escalated quickly turning to violence.